LC VAMP: Shoes Moving & Surprise! Putting it to a Vote! I just wanted to let you guys know I moved the shoes back to the smaller store for the duration of the sale to free up some room for Ginny. I also have a surprise! I'm retiring 5 pairs of shoes forever. They're all on sale for $100, and the fatpacks are deeply discounted on top of that! Have a great day, and thanks. I know it has been a long time since I have announced anything, so here are few bits of good news. I have decided to extend the Last Call $100L sale through the end of March, to accommodate customer desire for more shopping time before Last Call closes its doors permanently and Ginny Talamasca retires from SL. Secondly, based on requests and the knowledge that Last Call fashions will all be destroyed and Ginny Talamasca will be retired pending the close of the store, I have had requests to re-release previously retired ‘Vintage’ inventory loyal Last Call customers missed out on due to the short time spans of earlier events. It is based on these requests that I am considering Re-releasing discontinued (but not Limited Edition) outfits for the final 3 weeks in March preceding the close of Last Call. However, I will; NOT do this without express permission from the Last Call update group and SL client base. In short, I am putting the matter to a vote. Starting today, February 29, and running until Friday March 7 I ask that all those who wish for me to Re-release retired Vintage Last call Items to please send Ginny Talamasca a note card titled ‘LC Re-release’ and simply write “yes” or “no” on the card. After a week I will tally the votes and either put the retired inventory up for sale or leave things as they are until the store officially closes on March 31. If the release is requested, all re-released items will be permissioned in the same manner as current Sale items. That being : Modifiable, Transferable, but NOT Copy enabled. Despite the pending gossip back-lash from even proposing this Re-release event, I feel it is only fair to make the offer and leave the decision up to all the wonderful people who helped make Last Call an amazing experience for both myself and my late friend/business partner. This will be the absolute last opportunity for any and all original designs produced by the two of us ( Ginny Talamasca and Katterina Dagostino) to be purchased at Last Call. AS I have previously stated, and would like to post one more time….ALL Last call items will be deleted from Ginny’s inventory, re-released or not, following the conclusion of the Sale on March 31. Please feel free to IM either Ginny or Katterina with questions pertaining to the sale, and please submit all Notecard votes related to the Re-release of vintage Last Call inventory no later than Friday March 7. The Decision will be posted, or Re-released, accordingly that following Monday March 10. Short and sweet post: I want people to be aware of yet another content ripoff artist, boa Sinatra of BoA Creations. She has stolen textures of my boots (let's nevermind the fact that they are watered down versions of my own designs) as well as textures from several other creators. It is -so- obvious that she ripped the texture, because as you can see, she "cleverly" used a hue slider on them. A big thank you to Maitreya's crew who was kind enough to contact me about this theft. This is inexcusable, and I hope that we will all visit her store and file reports. I said I'd give her 24 hours, but screw that. DMCA is getting faxed once this is posted. PLEASE, continue to support original content creators and NOT these pathetic wannabes. All issues with the Sim have been corrected! A technical issue has arisen in regards to Last Call and the Dazzle Sim itself. In light of this development, Ginny Talamasca of Last Call and Linden Labs have agreed to take Dazzle off-line until these issues can be resolved. Concurrently, the sale and all customer service issues will be put on hold for the duration of the “off-line’ period. Both Linden Labs and I are confident that everything will be resolved by the fist of February at the latest, also the sale shall be extended a time equal to that which the Sim was unavailable to its customers. Another quick clarification for anyone interested in purchasing Last Call, Ginny's work, and so forth. I know this doesn't apply to 99.9% of people, but I wanted to have a very definite post to point to for those that contact me about this - which is to say about 20% of the IMs I've been getting lately, and the time has come for me to stop typing it over and over and over! I'm not Ginny. We're separate people and we always have been. We are not interested in selling any part of Last Call or the designs to anyone. I hope I don't seem rude, I just want to be firm and clear. Thanks for reading! I just wanted to clarify that I will be continuing to run Last Call as I will be taking over the Dazzle sim. It will not be closing aside from setting up for the sale, and I will continue to offer shoes there as well as branch out into other areas of fashion! Starley's presence will also remain and expand, Caliah her jewelry, and so forth. It saddens me that the current incarnation of Ginny is planning to move on, as the last 2+ years have been very special to me. Under Ginny's tutelage I feel like I've become a better business person and content creator in Second Life, and I always felt a great deal more inspired! I am very excited to be able to step in and bring more to the table than I have previously. I hope that you enjoy this generous sale that Ginny is having, and continue to stay with us as we grow and develop. As Ginny stated, the store will not be reinvented - I wish to preserve it, because to me it is what the true brainchild of Ginny's (the idea AND the people behind her) and my talent. Starting Friday 1-11-08 at 9am SL Time, all Items created by Ginny Talamasca, Katterina Dagostino, and Devyn Carmichael will go on a final $100L sale. All Items will be marked as Modifiable and Transferable but will NOT be Copyable. So please be careful with items you purchase, once this sale has concluded all sale items will NO LONGER be available in SL from their original creators. Yes, that is right ladies and gentlemen, Ginny Talamasca has left the building, and unlike the $100L sale of ’06, she will not be reinventing herself under a new label. This will be the last chance for anyone wishing to purchase items created by Ginny, Katterina, or Devyn to do so from the Dazzle SIM. All items will be PERMANENTLY retired at the conclusion of this event and the keys to the island will be turned over to a new owner and long time friend. And by that statement I mean only the island itself and all shops not specifically operated by Ginny or Devyn will remain stocked and operational. I will continue to honor all Gift cards up until 7am Tuesday morning 1-8-08 when I shall close off the island to begin reprogramming the vendors and their respective inventories. I know that not everyone will get this notice before the deadline, so let me be clear. I will honor Gift Cards submitted after Tuesday morning and for the duration of the sale, BUT they will only be redeemed for the ORIGINAL item’s price NOT the sale price. Once Last Call has closed its doors following the conclusion of the sale all gift cards will be considered Void. The sale will run for approximately one month or possibly longer demand permitting. Finally I would like to thank everyone who has ever purchased, owned, or simply admired the creations my best friend and I fabricated in SL. These last two years working on this platform have truly been most exciting and emotionally rewarding stint in our long friendship. Thank you all for giving my friend the chance to witness unsolicited appreciation of his art, his taste, and his undeniable sense of style. The sale will begin at 9am SLT on Friday, January 11th. Everything made by Ginny, Devyn and Katterina (NOT Lyra Muse, I had a sale already) will be included in this event. If you have a gift card, it MUST be redeemed by Midnight SLT on January 8th. If you're not clear on how SLT works, it is pacific time. You can compare your time zone to pacific time zone on this site - please check these before you IM either of us about it. I am NOT Ginny, despite whatever rumors out there; we are definitely two different people. I (Lyra Muse) will not be able to redeem your cards, so please send them to her. If you have any questions about how this works, please read the section about Gift Cards in my profile picks. That should cover most of it. I'll be posting the flier we'll be using over the weekend here and throughout the sim as soon as I finish it up. If you have any further questions, I'll be happy to answer them as best I can. 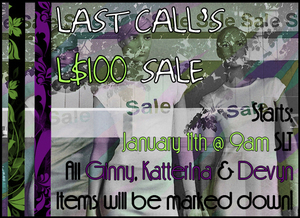 Hello everyone, I have decided to go ahead and hold a sale next Friday 1-11-08 for all items on the Last Call SIM produced by Ginny Talamasca, Katterina Dagostino, and Devyn Carmichael. In preparation for the sale I have taken down the Gift Cards from the store locations, and will no longer be accepting Gift Card submissions after Midnight on Monday 1-7-08 SL Time. The following day I will close down the Sim to reprogram the vendors to sale price and re-permission all items to be Modifiable and Transferable but no longer Copyable. I shall post again later this weekend with complete sale details, prices, items, times, duration of sale etc.